With standard universal swivel ball head, it's suitable for Pico Projector, Pocket Projector, and Mini Projector. Hold your device on both flat and uneven surfaces firmly. 【Super Compact and Portable】Weighing only 9.5 oz, your stand reduces to a mere 10.2 in to easily go anywhere. 【Easy Set Up】Ready to use in less than a minute. Just unfold the tripod legs, mount your projector, and find the perfect angle. 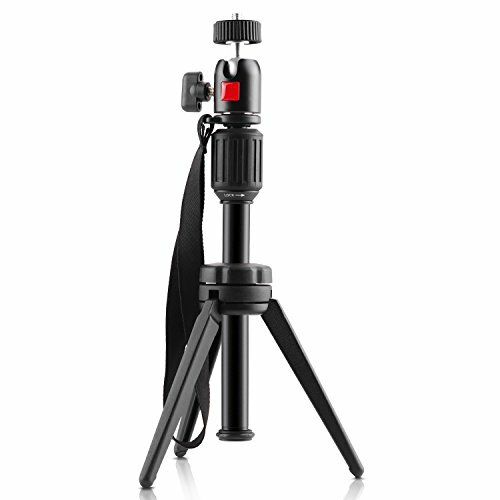 【Remarkably Stable】Tripod design supports a maximum of 5 kg, even at its full 15.7 in height. 【Adjustable Viewing】A swivel ball head provides full 360° rotation and up to 180° tilt to deliver the perfect viewing angle. 【What you get】1* Nebula Capsule Adjustable Tripod Stand, 12 Month 100% Satisfaction Guarantee and 24 Hour dedicated email support.